Companies don't work in reality as they do on paper. On paper, there are divisions (all made like a nice rectangle) and business processes with accurate inflows and outflows of information. On paper, things can be improved by modeling, the moved around and people can be taught to follow the processes that your diagrams represent. In real life, there are humans and the tools utilized by them. Sometimes the tool help in communication. In other occasions, tools move information from one user to another. People meet and talk and get to know other people, which leads them to trust some and distrust others. Some persons have different motivations and simply "pass by" one another. A subset of these individuals will have shared cultural expectations and values. It's possible to have many cultures in a company: it could be because the company is working in multiple places and because employees come from various places to join the company. Likewise, "business culture" is formed as leaders achieve successes and people start using "cultural expectations" to get things done effectively. The reality is a lot messier that the rectangles drawn on the paper. Enterprise Architecture use science, engineering, and aesthetics to start the company's transformation. EA is unique because many "change artists" are ignoring the science and are not focused on engineering. The majority doesn't even know how to spell aesthetics. But, when you are dealing with people, you have to use all of these things in order to achieve success. As Enterprise Architecture is relatively young science, the majority of architects have to rely on boxes and lines that represent enterprises, and not enough on messy but rather critical a sociocultural view of an enterprise. It's easier to document, create a model, or even simulate processes if people are interchangeable, and their relationships didn't make a difference. 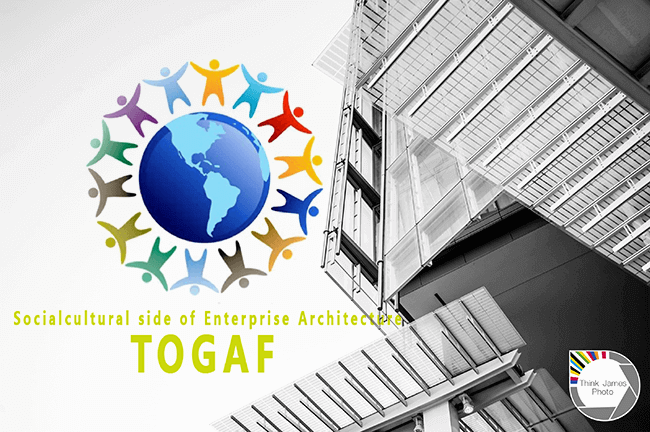 Enterprise architecture tools also don’t support these socialcultural aspects. The time has come to start working on ways to understand sociocultural architectures, relationships, and influences. We have to create the means to measure, detect and consider these structures when it comes to measuring capabilities, or improving processes, or evaluating business models, or any other thing that EA teams do. The Enterprise Architecture value typically comes to the CEO's in the form of an opinion that is backed by data that no one is paying attention to. Examining sociocultural influences could provide interesting ideas that would be valuable to CEO's. 1. Sociocultural influencers are able to impact the speed of the transformation within the company. 2. Sociocultural connections are able to affect the governance and decision-making processes. 3. Sociocultural strengths would support fast improvement in business capabilities required for a shift in strategy. 4. Sociocultural blind spots would keep the company from recognizing an existential risk. Think about it. If sociocultural aspect matters, why are Enterprise Architects not following them, learning from them, using them for decision making? The only reasons why it is really hard to do is and EA has not tried it yet. We expect in the future that enterprise architecture tools will start providing support for this as well.